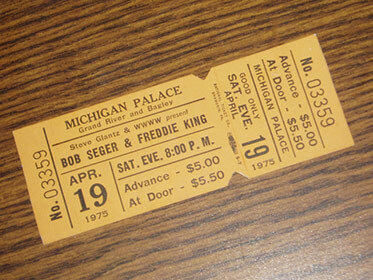 DETROIT, MI — We are selling authentic rock concert tickets from the historic Michigan Palace (a.k.a. Michigan Theater). All tickets are in mint or near-mint condition and are selling at dirt cheap prices. New tickets are added all the time so bookmark the eBay page and check back soon. Featuring tickets for acts such as Aerosmith, ZZ Top, Alex Harvey, Cheech & Chung, Sly and the Family Stone, Bob Segar, Blue Oyster Cult, and a whole lot more. All tickets are from around 1975 and have intact stubs. Click here for the eBay link. Happy bidding!